"You probably don't recognize me with my red arm." Exclusive limited edition chrome C-3PO action figure! Fresh from the Battle of Takodana in Star Wars: The Force Awakens. First-ever C-3PO action figure at this scale with his classic reflective finish! The protocol droid stands 18-inches tall. He's shiny and gold, just like in the movies! Entertainment Earth Convention Exclusive! 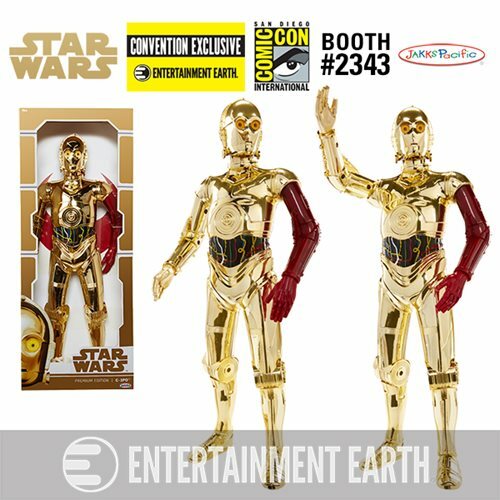 From Jakks Pacific's Big Fig 20-inch scale collection - and available only at the Entertainment Earth booth #2343 at San Diego Comic-Con International 2016 - this limited edition Star Wars: The Force Awakens Premium Edition Vac-Metal C-3PO 18-Inch Big Figs(TM) Action Figure - Convention Exclusive is a shiny gold robot boasting 7-points of articulation. His chrome finish is as shiny as you please, with a red arm to honor his fallen friend from the days following his adventures on Endor. C-3PO comes packaged in an amazing premium edition box featuring an exquisite Resistance symbol backdrop and gold foil highlights. At 18-inches tall, this Entertainment Earth Exclusive is the first time a C-3PO action figure has been offered with his classic reflective finish at this scale. It's like a mini-replica of the suit Anthony Daniels wears in the film, so you can almost hear his voice in your head! You'll thank Jakks when you bring home this Resistance spymaster and famous translator.